Super Savings Item! 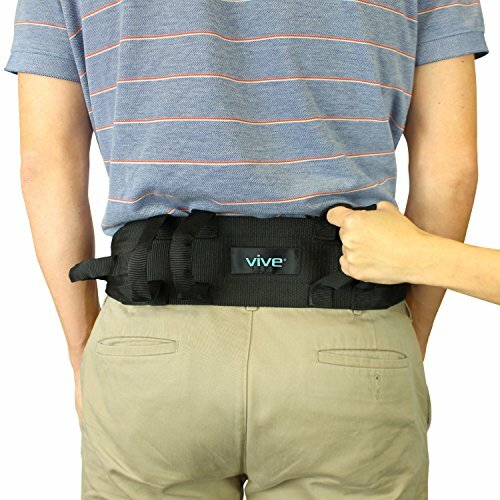 Save 33% on the Transfer Belt With Handles by Vive - Medical Nursing Safety Gait Assist Device - Bariatrics, Pediatric, Elderly, Occupational & Physical Therapy - Long Gate Strap Quick Release Metal Buckle - 55 Inch by VIVE at Get Cheap Health Insurance. MPN: RHB1011N. Hurry! Limited time offer. Offer valid only while supplies last. Transfer Belt by ViveThe transfer Belt allows you to easily ambulate patients. The quick release latch makes it easy to put on and remove the belt. EASILY MOVE AND TRANSFER: Safely and effectively assist patients or loved ones. Handles allow for assistant at any angle for physical therapy, ambulation or transfers, reducing the risk of caregiver injury. Prevent falls and other embarrassing situations safely and put an end to grabbing loved one painfully by the arm or by the seat of the pants. SIX COMFORTABLY PADDED HANDLES: Four vertical handles and two horizontal handles allow caregivers to provide assistance from any side and any angle. Each handle is padded for a comfort, yet secure grip. QUICKLY ADJUST AND REMOVE: Transfer belt is adjustable to accommodate waists up to 51". The durable metal buckle features locking teeth to secure the belt in the desired position and a quick release latch making removing the belt fast and easy. EXCEPTIONALLY STRONG AND EXTRA WIDE: Constructed with strong nylon webbing, the belt stitching is reinforced for exceptional durability. The transfer gait belt back is four inches wide to provide a comfortable experience with greater area of contact to easily disperse pressure.The extra width also enables the belt to handle a higher weight load and not ride up on the patient's sides.